Raydium 3D Game Engine • View topic - 21 new blocks !! Post subject: 21 new blocks !! I finished the 10 first blocks of the new world. Textures are going to be ajusted. You can download the .zip and test a new track that use all the new blocks. Last edited by SamB on Fri Oct 06, 2006 12:08 am, edited 1 time in total. It's just a start. I hope to be able to make 50 or 60 blocks for the new world. This week I'll try to make a set of arerial blocks to let the user makes tracks with height..
longroad and flatblocks are tracks using only classic blocks. aerial is a track mixing classic blocks and bridge blocks. In the furture, it will be easier because I'll make terrain blocks to do elevation. bridge is a fun track using all the brigde blocks, a kind of rollercoaster. Xfennec : how I can modify car weight to test what are the best values. The car, especially in bridge.mni need to stay on the road. The next set will be about enhanced bridge blocks, I will curved some blocks. 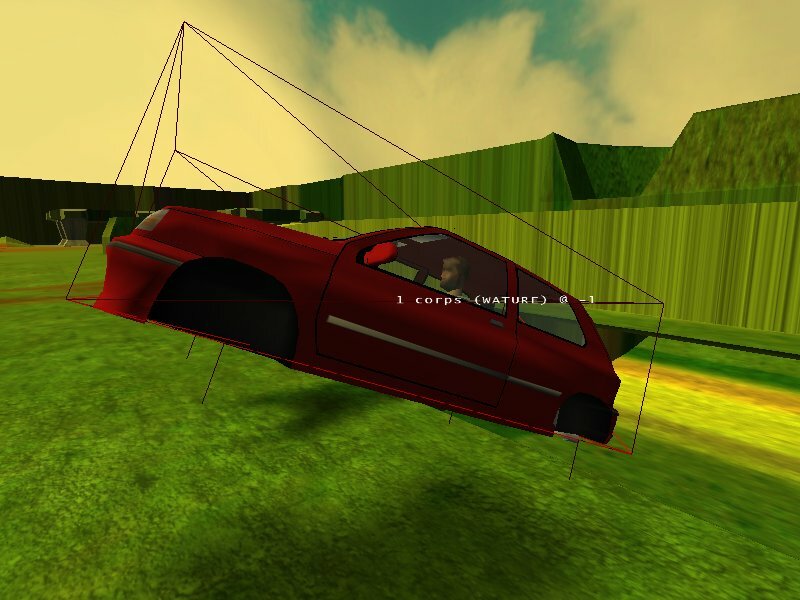 About the behavior of the car, it's not just a matter of weight, the whole car physics need to be reviewed and changed (suspensions, wheels/road contact point, steering, ...). These new blocks will allow me to start on this subject very soon (can't look at this at the moment). Awesome ! ManiaDrive looks like a real game with these blocks ! ... Now, it's my turn ... let's make whole new physics with your test tracks. About new physic, i can suggest something. 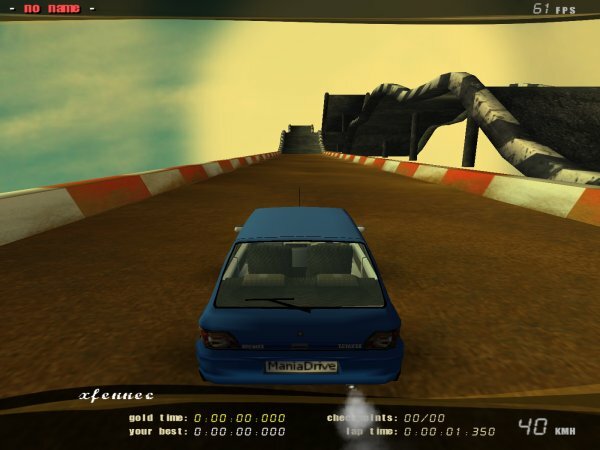 For car wheels: using to sphere fixed together with an offset in the direction of the suspension, allow to render car sliding on tight curve. In fact if the car begin to tilt, the "adherance" of one of the two sphere decrease and the car can slide like "normal" behavior. I use this solution to simulate a real R/C car using Ode. I can't make deep analysis, but this can help to have a realistic behavior. However the problem between sphere and road border is still there. The idea is nice I'll first try to create a car with famous "ray wheels", witch allows a lot of tweaking. This new physics allows us to tune way more things that our previous "sphere car", and already features a way more arcade style. although is not finished, couldn't be usable here "carlib"(you know )? Still it uses sphere for wheels, but in a future i want to add cilindric wheels. And it is (or will be) easily configurable. And maybe one day it will have an editor. After a few hours of hacking, it starts slowly to work ... The car is now able to move forward and backward without any major glitch, even if the whole thing still need a lot of tuning with physics params (mostly mu/slide/erp/cfm/forces).